Welcome back to the Support Synergy series! This series focuses on all of the different support heroes available in the Halcyon Fold, and which heroes to pair them with. 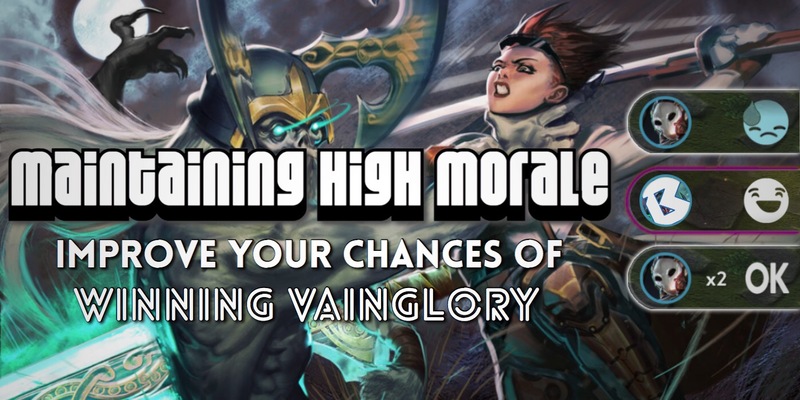 In previous entries, we’ve looked at Fortress, Catherine, Ardan, Adagio, Phinn, and Lyra. Today, we’ll be analyzing Grace. As the newest hero to the Halcyon Fold and a highly anticipated new support hero, Grace has already made for a favorite first pick or ban option, and for good reason. 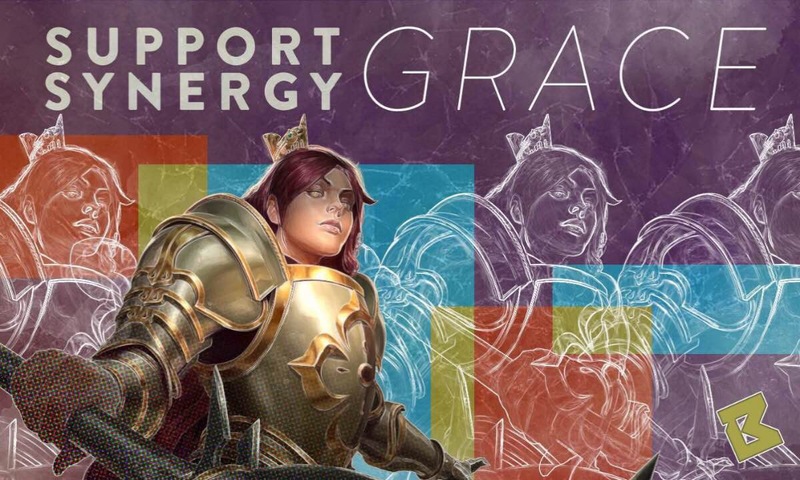 Grace has one of the most flexible ability kits in the game, and her mixture of crowd control, protection, and healing allows her to dominate in most team compositions. Fulfilling the classic paladin role, Grace protects her teammates with holy shields and healing to reduce incoming damage from enemy teams, helping them stand tall in team fights. 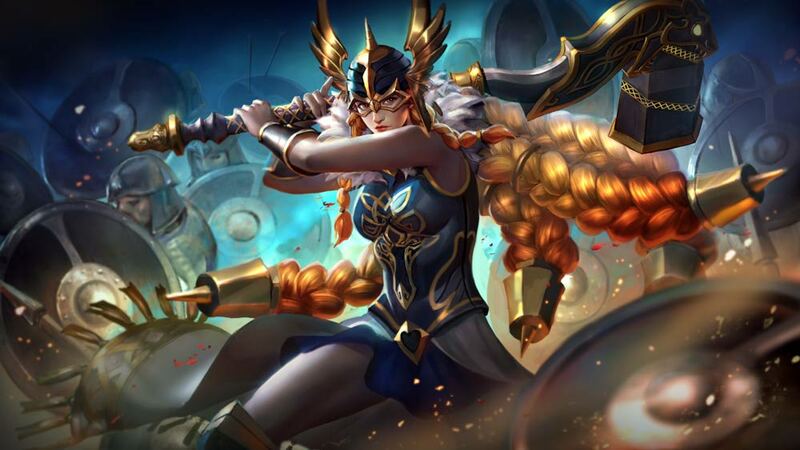 Her shields combined with her slows and stuns can often roll an early game into a quickly snowballed victory, or scale well into late game team fights to heavily reduce the damage coming out of the enemy carries and massively heal her teammates. Let’s look at each of her abilities in more depth to understand exactly how Grace helps her carries dominate so well. When Grace basic attacks, she channels a second, stronger attack that deals bonus AOE weapon damage and slows any enemies in a cone in front of her. The length of this slow scales with crystal power. Each time she lands one of these attacks on any enemy—including minions or objectives—all of her ability cooldowns are reduced by 1.5 seconds. This perk makes her a monster to deal with in the early game. The bonus damage hits harder than you might think, and it scales with 130% of weapon power; so, an early weapon blade makes her pack even more punch. Grace also has the fastest base walking speed in the game, so she can easily land her slow, walk to reposition herself behind enemy heroes, and land another slow. Paired with an early game jungler like Koshka or Grumpjaw, Grace can establish early game jungle and vision dominance with ease. It is also important to keep in mind the cooldown reduction in or prior to team fights. Landing a few retribution attacks can help Grace get each of her abilities off much more frequently. Grace dashes to a target hero and lands an empowered Retribution attack that scales with crystal power. Upon activation, Grace applies a directional holy shield on nearby teammates that will continually face Grace’s target and reduce incoming damage, and Grace receives a fully holy shield that reduces incoming damage from all sides. It is important to note that the shield on her teammates is directional as opposed to hero-specific, so even though the shield will continually face Grace’s target, all damage coming from that direction onto your carries will be reduced. When overdriven, casting Grace’s Divine Intervention resets the cooldown on Benediction, allowing her to chain her A into her C back into her A. For bonus points, build a Shatterglass for longer lasting shields and stronger healing, or an Echo to never stop chaining abilities! Grace channels in place for a brief duration, after which she unleashes a stun in a circle around her, tossing all enemies caught in the circle up into the air, stunning them for one second. Against slippery heroes like Vox or Taka, it is difficult to land Holy Nova. Against slower heroes like Celeste, Baptiste, or melee brawlers like Rona, you should be able to land this ability quite often. Landing it on two or more enemy heroes in a team fight can often be the difference between winning and losing, so choose when and how you use it wisely. Sometimes the threat of Holy Nova can be just as useful as using the ability itself. Position yourself between a hero and where you think they want to walk and dare them to walk by you. If they know you have Holy Nova available to use, they will often go out of their way to avoid you. When Grace overdrives Holy Nova, she gains immunity to negative status effects like stuns, slows, and silences while she is channeling the ability. You will most often want to overdrive Benediction due to the power that combo unlocks and Divine Intervention for the ridiculous cooldown reduction. Against heavy crowd control teams, though, it is worth considering whether to overdrive Holy Nova first. Upon activation, Grace and her target receive a fully holy shield for 1.8 seconds. During this time, Grace will channel in place, after which she releases a massive heal on her target. The base heal is huge on its own but also scales extremely well with crystal power. If your target is taking heavy damage, begin channeling sooner rather than later, because you do not want them to die while you are channeling. Also keep a Reflex Block available while channeling against enemies with stuns that can cancel the heal. While Grace has already become one of the strongest captain heroes, she does have some vulnerabilities. She is extremely strong at engaging with her dives, slows, and stuns, but once she is in a fight, she has a hard time disengaging, leaving her and her team vulnerable to counter-engages. Grace is also susceptible to kiting. If a kiting hero can escape her and her teammates’ dives, they can often slip just far enough away to dish out heavy damage while Grace cannot escape. Relatedly, Grace can provide peel for her teammates with Benediction and Holy Nova if she lands it, but quick heroes can jump past her and get onto their targets despite Grace’s best efforts. Grace pairs well in diving and kiting team compositions. With dive heroes, Grace can dive in right alongside them, slow their target, and try to land her stun; all while reducing any incoming damage. Then, Grace can heal her diving ally to keep them in the fight. With kite heroes, Grace acts as the barrier between the kiter and the chaser—slowing, stunning, and reducing damage from the enemy chaser, and healing her teammate back to full health in the event they do get caught. That said, Grace’s kit is flexible enough to add value to almost any team composition. Adagio: Double heal! Much like pairing Adagio with Lyra, CP Adagio with Grace can sustain through almost any fight. Grace’s Holy Nova also helps protect Adagio from enemies that dive onto him and helps lock enemies into Adagio’s Verse of Judgement. Baptiste: The circle on Baptiste’s Ordained is nearly the exact same size as the circle on Grace’s Holy Nova, making it extremely easy to chain these two stuns together. Pair that with the synergy between Baptiste’s sustain and Grace’s heals and shields, and you have one nasty duo. Baron: Baron can dish out more damage than almost anyone; he just needs to stay alive to do so. 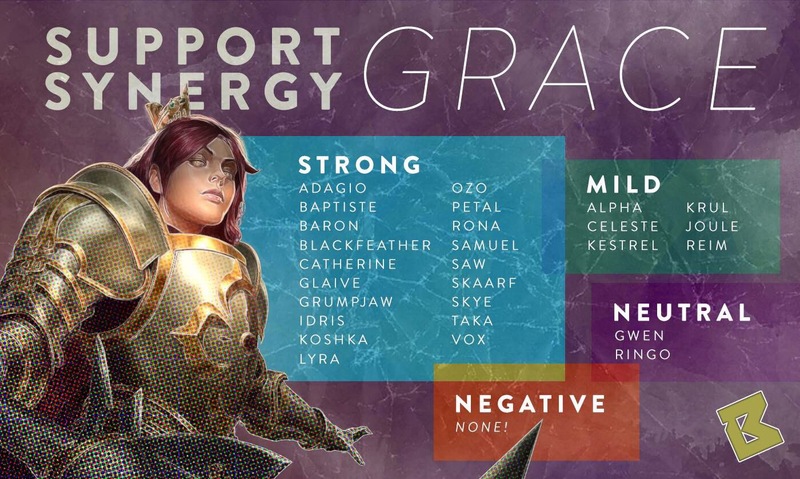 Grace can protect him with her shields and healing to help him blast through the enemy team. Blackfeather: Built CP, Blackfeather can dance on the edge of fights and poke with On Point while Grace dares enemies to try and get near him. Built WP, Blackfeather can dive into fights while Grace protects him and keeps him healed up. Catherine: Making her first appearance in the Support Synergy series, Catherine’s stuns, silences, and shield of her own pair extremely well with Grace’s kit. Paired with a heavy damage carry, Catherine and Grace can lock down any target while protecting the carry and letting them go to work. Glaive: Glaive can use his Afterburn to knock enemies back into Grace, who can then use her Holy Nova for another stun, making for a deadly early game gank combo. In the late game, Grace and Glaive make for a bruising front line, behind which an ally carry can dish out all the damage they please. Grumpjaw: When Grace jumps in with her Benediction, it makes it easier for Grumpjaw to jump in and land his Grumpy, which then makes it easier for Grace to land her Holy Nova. After that, Grumpjaw can eat an enemy carry and Grace can heal him up to secure the kill. Idris: Quickly becoming one of the most popular carry picks, Idris pairs well with Grace built either WP or CP. Built WP, Grace and Idris become one of the strongest dive comps around. Built CP, Grace helps keep enemies at arm’s length while he kites them to death. Koshka: Grace’s early game power teams up extremely well with Koshka. Koshka’s speed boost paired with Grace’s slows from her perk make it near impossible for enemies to run away, and their early damage output is unmatched. Often times, their early game prowess is too much, and it snowballs into a quick win. Lyra: As mentioned in the Support Synergy Lyra article, Grace and Lyra make a compelling duo. Both Grace and Lyra can flex into different roles, so you will keep the enemy team guessing in draft. Whichever role you put them into, Lyra’s Bulwark makes enemies helpless to avoid Grace’s Holy Nova, or vice versa. Pair that with both of their slows and healing, and you have the foundation of a solid team. Ozo: Ozo likes it when his targets are in bunches, and Grace helps keep enemies bunched up with her slows and stuns. She can also heal him so he can keep on bouncing. Petal: CP Petal puts Frostburn to work, using her Munions to slow down any oncoming enemies and jumping away at the last second if they get too close. Grace helps keep enemies at arm’s length by stacking her slows onto Petal’s, and the doubled up slow makes it much easier for Grace to land her Holy Novas. Rona: Rona’s Into the Fray has almost the exact same circumference as Grace’s Holy Nova, and Grace’s Benediction makes it easier for Rona to land Into the Fray. If Rona can get her Red Mist started during the stun from Holy Nova, she can dish out a ton of damage in a hurry and tilt a team fight in her team’s direction. Samuel: Samuel is another hero who makes the most out of Frostburn, jumping all over the battlefield and slipping away from his enemies. Grace helps him stay at a safe distance with her crowd control. Samuel’s Oblivion can also set up a devastating Holy Nova, or vice versa, for a deadly combo. SAW: WP SAW is a single-minded hero, and Grace helps him stay in the single frame of mind. She shields against any carries trying to burst him down, stuns any enemies getting too close, and heals him up if his health gets low. CP SAW does not pair quite as well with Grace, but she can help him build up Broken Myth stacks and slow down his targets for massive shanks. Skaarf: Grace helps Skaarf farm throughout the early game and scale into his deadly late game. Once Skaarf reaches critical mass, Grace protects him with her holy shields, while keeping enemies within his long rage with her slows and stuns. Skye: Another jungler who makes the most out of Frostburn, few heroes kite better than Skye. Skye dares enemies to run into her Forward Barrage, and Grace’s slows, stuns, shields, and heals make that an even less appetizing proposition. Taka: Taka thrives when he can dash into a fight, dish out heavy damage and a mortal wound, and escape under his box until his abilities come back off cooldown. In some team compositions, Taka’s in and out fighting style can leave the carry and captain fighting two on three too often. Less tanky captains cannot protect their carries by themselves, but Grace’s kit allows her to keep her carry safe until Taka dives back in. Vox: Vox is one of the slipperiest heroes on the Fold. Already tough to pin down, Grace’s crowd control makes Vox even harder to get a hold of. Pairing Grace’s heals with the sustain of Vox’s usual Poisoned Shiv build can often be too much for enemy teams to deal with. Alpha: Alpha and Grace can be a deadly comp. Alpha is extremely difficult to take down on her own, and paired with Grace’s shields it becomes even harder. She does not have the same dive prowess as some of her jungle counterparts, however, which can sometimes leave Grace and Alpha stuck just out of range of their targets. Celeste: Celeste does best when she controls team fights from a distance. Grace can help her do this, but sometimes she does not have enough peel to keep the squishy Celeste safe. Kestrel: Built WP, Kestrel play similar to Ringo, hovering on the edge of fights dishing out damage, where Grace does her best to keep enemies away. Built CP, Kestrel can use Grace’s slows to blow up her targets, and Grace can lure enemies on top of her traps to blow them up for a stun and massive damage. Krul: If timed correctly, Grace’s Benediction can slow down Krul’s target so he can land From Hell’s Heart, which sets Grace up for a Holy Nova. Krul can usually secure a kill if this combo lands, but if the enemy manages to escape, Krul and Grace can find themselves sitting ducks. Joule: Similar to Krul, Joule can use Grace’s Benediction to help her land her stun, which can help Grace land another stun. Also similar to Krul, if the enemies survive that chain of stuns, Joule and Grace probably will not win that fight. Reim: Reim is one of the toughest melee junglers around, going toe-to-toe with any other melee hero. Grace can help him stand even taller in fights, but kiting enemies will make quick work of this pair. Gwen: Grace helps Gwen with her crowd control, but once enemies get their hands on Gwen, Grace often cannot do enough to save her. Ringo: Much like Gwen, Grace does her best to keep Ringo safe in fights with her crowd control and shields, but once enemies get their hands on him, Ringo goes down quickly. As you can see, there are no heroes who Grace makes worse. Grace pairs well with almost any hero, but in order to make different hero pairings work, it is important to understand exactly how her abilities and mechanics work. Different team compositions will call for a different play style out of Grace, ranging from a diver and chaser to a protector and guardian. Once you understand exactly how to play her in any given composition, you will be able to unleash Grace the Paladin’s full dominance.